Superintendent Shelley Arrott hugs Child Nutrition employee Cheryl Sitterly and presents her a bouquet of roses for being the support employee with the most years in the district – 37! 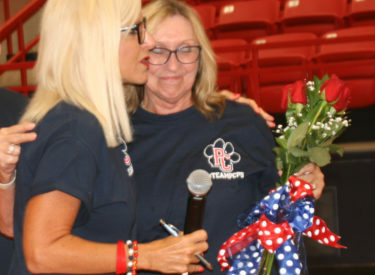 All support staff were recognized for their years of service with a paw print pin indicating their years of working in the district in five-year increments. Wildcat Steppers, Cheerleaders and the Big Blue Band performed and celebrated PCPS support employees at the Support Back-to-School Motivational Assembly held Wednesday in Robson Fieldhouse. A similar agenda was followed at the certified staff assembly celebrating raises, facility improvements, community support, and a revised school calendar. Superintendent Arrott told employees the Board of Education approved restoring last year’s step raise plus a step for this year. Employees responded with ovations and received free Team PCPS T shirts funded by a local donor.